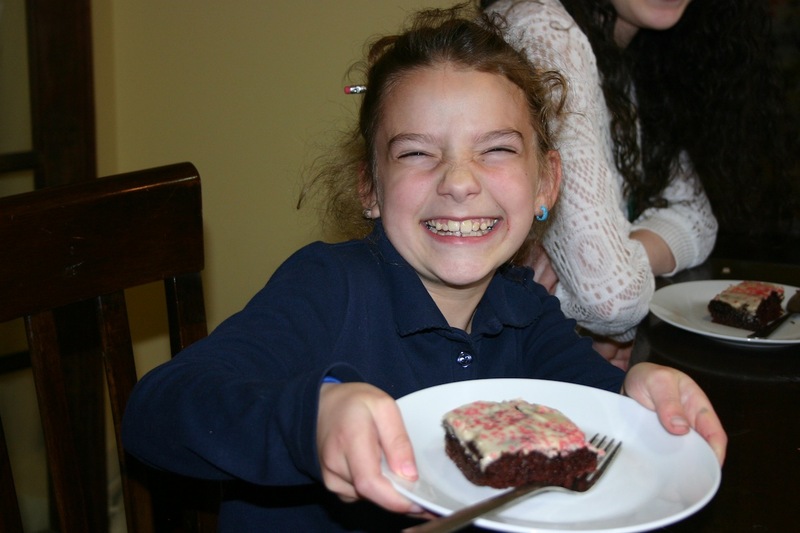 It’s my daughter’s 9-year-old Hebrew birthday today, and while we don’t usually celebrate Hebrew birthdays with a frosted cake, for my middle daughter–who rarely demands anything–we did. And like any good kids’ birthday cake, it was full of sugar, butter cream frosting and pink sprinkles. Pink, as in food-coloring-red-40-pink. I don’t feel one bit bad. In fact, I feel like a pretty good mom for making a homemade cake (and remembering the Hebrew date!) amidst a busy day. I’m not a big fan of lots of sugar or food coloring, and we pretty much avoid it. If I had a pomegranate on hand, I would have colored the clear sprinkles with the juice (which is the reason I buy them clear in the first place!). But, I don’t think that the one drop it took to color a whole bag of sprinkles pink will cause my kids any damage. There are times, like a birthday or a special weekend when our nana visits, that I think it’s perfectly normal to eat junk. And on those occasions, you’ll find our kids gulping down a frosted piece of cake or guzzling a slurpee. Because in our house, raising healthy eaters is not about deprivation, but rather it’s about teaching portion control, making healthy choices and building a life-long healthy relationship with REAL food. Sometimes that means letting kids be kids. For the cake, I used this recipe for Hostess Cupcakes.